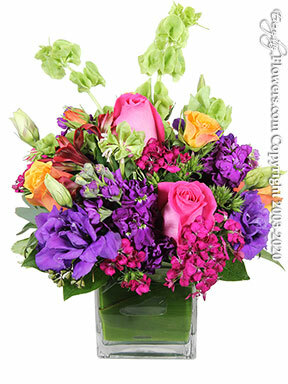 Designed in a 4"x4"x4" cube vase using orange and pink roses purple lisianthus dianthus alstromeria and Bells of Ireland. Delivery: Same Day delivery is available Monday-Friday until 3PM and Saturdays until 1PM. 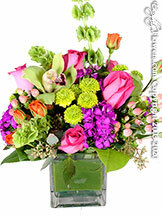 We deliver flowers and balloons to the cities of Aliso Viejo, Anaheim, Anaheim Hills, Brea, Buena Park, Corona del Mar, Costa Mesa, Coto de Caza, Cypress, Dana Point, Foothill Ranch, Fountain Valley, Fullerton, Garden Grove, Huntington Beach, Irvine, Ladera Ranch, Laguna Beach, Laguna Hills, Laguna Niguel, Laguna Woods, Lake Forest, La Mirada, Mission Viejo, Newport Beach, Orange, Placentia, Rancho Santa Margarita, San Clemente, San Juan Capistrano, Santa Ana, Stanton, Trabuco Canyon, Tustin, Villa Park, Westminster, Yorba Linda. Sent this to my Mom for her birthday and she loved this arrangement. Would order again from this place.